This statistic shows the extent to which respondents of a survey carried out in March 2013 agree that they would travel (more) by bus if it was more difficult for them to find somewhere to park the car. 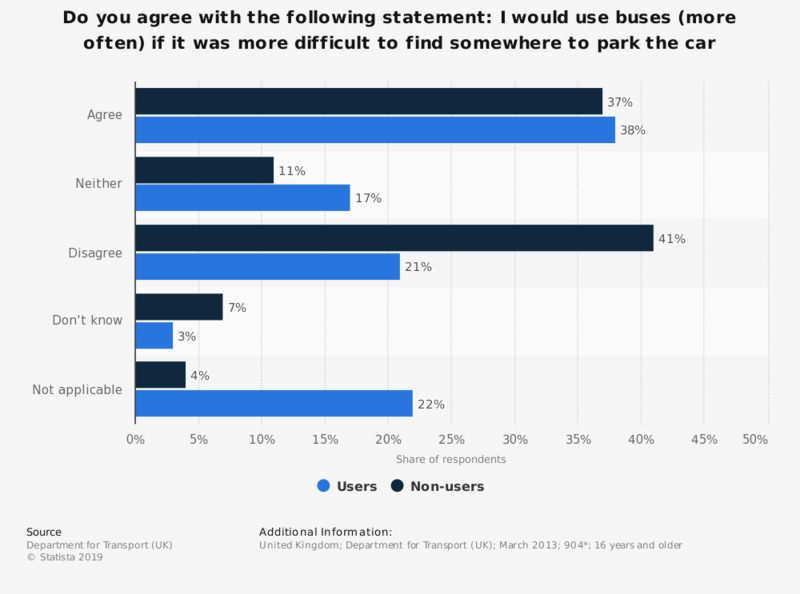 A similar number of users and non-users agreed that difficulties with parking the car could make them more likely to travel by bus, although 40 percent of non-users disagreed. Not applicable here refers to those who do not drive cars normally. * Non-Users (n=428); Users (n=476). Why don't you use / what is the main reason you don't use local bus services (more often)? How often do you travel by bus? Do the bus services from the bus stop nearest to your home go to any of the places where you would want to go?